Game 6 of the World Chess Championship was one to remember. Magnus Carlsen of Norway, the world’s No. 1 chess player, fended off a vicious siege at the hands of U.S. grandmaster Fabiano Caruana, the world No. 2, in London Friday. It was the sixth frame of the World Chess Championship, and one that for hours appeared likely to give the American a critical lead. But Carlsen escaped, and the match remains level, 3-3. Each of the six games so far have been a draw. “It’s a miracle save,” said Robert Hess, an American grandmaster commentating on the match for Chess.com. To catch you up: Carlsen is seeking his fourth world title while his challenger Caruana is trying for the first American world championship since Bobby Fischer in 1972. Their horns are locked in the middle of a best-of-12-game match for the game’s most important title. The two began Friday’s Game 6 in one of Caruana’s favorite openings: the Petroff. (Specific lines of this opening were featured in the deleted video that scandalized the match days ago.) Game 6’s first three moves appear in 12,289 other games in the ChessBase database. In 11,802 — or 96 percent — of those, white moves its knight to f3 on its fourth move. In 17 of those — or 0.1 percent — white moves its knight to d3. Carlsen moved his knight to d3. Chess players are second only to maybe biological taxonomists in their proclivity to elaborately name things, and sure enough even this rare position has its own proper name: the Karklins-Martinovsky Variation. But neither player was troubled by Karklins-Martinovsky, they said after the game. Its theory is well known to these elite players. And so they played on. The powerful queens came off the board by move 8, but this loss took no edge off the fight. For a while, the game looked less like a battle and more like a dressage competition, as 66 percent or more of each player’s first 12 moves were knight moves. Many moves later, as the game cantered through its middlegame, winning chances emerged and swelled for Caruana’s black pieces, according to both the computer engine and human grandmaster commentators. (Surprisingly, black, which is usually at a disadvantage, has often had an advantage over white in this match.) While there was no single blunder for Carlsen, there was an accumulation of … what to call them? “Mistakes” seems too serious. “Slip-ups” make them sound like pratfalls. Let’s go with “inaccuracies.” Carlen admitted after the game that he’d made a number of imperfect moves. By move 34, knights and bishops were the only firepower left on the board, and they threatened salvo after salvo in a crucial struggle over the pawns. By the 47th move, Carlsen was down a knight but up three pawns, which gave him a few slim hopes. Two had open routes to the end of the board, where they could become queens. Much delicate, asymmetrical and impossibly complex maneuvering commenced, as Caruana tried to prevent the pawns’ promotion. A dozen moves later, Caruana had captured three of Carlsen’s pawns, including those aspiring to become queens, and still had one of his own. That left him in a victorious position — if only he could see it. On the 68th move, a supercomputer analyzing the game found a guaranteed checkmate a distant 30 moves down the road — down a lengthy bridle path, say. Caruana is an unbelievably strong player — though not that strong. As play continued, the silicon’s guarantee quickly went away. If only Carlsen could eliminate the pawns, he’d survive: a bishop and a knight versus a bishop is a theoretically guaranteed draw. Finally, through many feats, Carlsen was able to spirit away his king to a fortress on black’s side of the board. Despite black’s apparent material advantage, there was no progress to be made. The players agreed to a draw on the 80th move. So, another draw, huh? Yawn, am I right? Not so fast. Today’s Game 6 was an instant classic. Journalist David Hill, who’s been in London reporting on the match, tweeted that there can be beauty in draws. Not all of them are created equal. And while the six consecutive draws we’ve seen thus far is a lot, it’s certainly not a record. Carlsen and Sergey Karjakin began their 2016 world championship match with seven draws. Garry Kasparov and Viswanathan Anand fought to eight in a row to open their 1995 match. And at one point in Kasparov’s 1984 championship match against Anatoly Karpov, there were 17 straight draws. “There was a 20-second burst of applause” after a decisive game broke the grueling streak, the New York Times reported. That match, which began in September, was finally halted in February of the following year — 40 of its 48 games were draws. 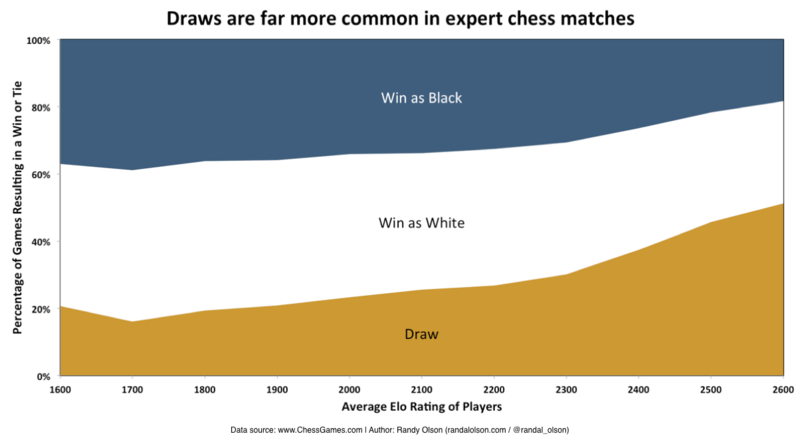 The data scientist Randal Olson analyzed hundreds of thousands of chess games in an article a few years ago. The closer players are in rating, he found, the longer games tend to go. And as the players get better, draws become far more common. 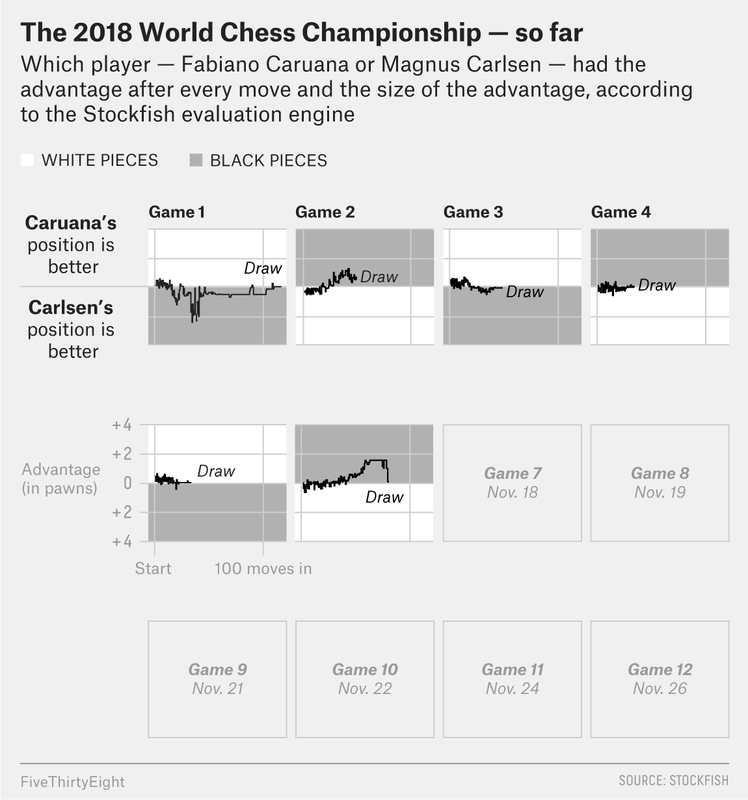 Carlsen and Caruana are as good — and about as close in rating — as you can get. Indeed, they are even beyond the scope of Olson’s chart below, with Elo ratings (which measure the strength of players given the opponents they’ve played) north of 2800. The match rests tomorrow. Game 7 — in which Caruana will once again have the black pieces — begins Sunday at 3 p.m. Greenwich Mean Time. That’s 10 a.m. Eastern. I’ll be covering it here and on Twitter. While the chart below shows a big advantage for Caruana throughout most of the end of Friday’s game, the computer engine is not always perfectly reliable when it comes to numerically assessing complex, fortressed-based endgames.